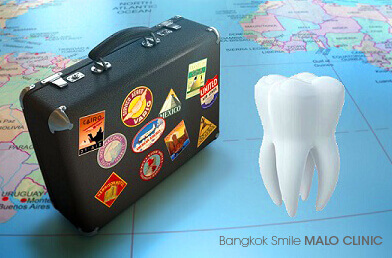 At Bangkok Smile MALO CLINIC, all we want is for you to experience the most amazing dental holiday in the Bangkok, Thailand - The Land of Smiles. Here are some helpful hints for you to follow so that you'll be spending less on the dental chair, and more time to get the most of what the city has to offer during your dental vacation. To get a more detailed treatment plan of some definite treatments (such as dental implants, crowns/bridges, root canal treatment, and wisdom tooth removal) - sending us a Panoramic X-Ray of your mouth would be very helpful. X-rays can be taken at either dental clinics, x-ray clinics, or hospitals. To get an accurate treatment plan for dental veneers or other cosmetic dentistry procedures, sending us pictures of your actual teeth would likewise be very helpful. To make a dental appointment for regular teeth cleaning, tooth fillings, normal extraction, and teeth whitening, your pictures or x-rays are NOT required. Your personal information and medical history are very important for our dentists to be able to establish the best treatment for you. All information submitted to us will stay strictly confidential. If you do not have any digital X-Rays of your teeth, don’t worry - you may send us some enquiries first, so we can start an initial examination immediately. Once we receive your initial enquiry, we will immediately contact you in order to know you and evaluate your needs, identify your motivations, and answer all of your questions. Upon letting us know your decision, we will gladly book your dental appointment. Let us know your preferred date of travel and we will book your dental visit. Since it’s highly important that a trustful relationship between you and our dentist should be established, we will answer all your questions before starting any treatment. We openly agree to give you clear information, including the advantages and disadvantages, and the total cost of your desired treatment plan. With your approval, the dental treatment will start.